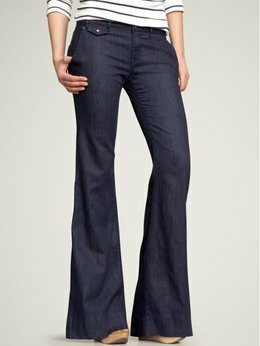 TALL WIDE LEG TROUSER JEAN at Gap.com. $69.50. Sizes 2 to 16. Shown in dark wash. Also comes in pintucked, white wash and faded dark wash.
CLARKSTON STRETCH TROUSER at Alloy.com. $39.90. Sizes 1 to 25. 37" inseam. Cuff can be brought down for additional length. Shown in charcoal stripe. Also comes in black and grey. TALL PUSH-UP LEGGING: WIDE LEG at Shapefx.com. $34. Sizes XS to XL. There is nothing like a simple black dress. You can style it up or down, wear it in every season, sport it at work or at a night...the possibilities are endless! My favorite little black dress of the moment is the Tall Sheath Dress with Power-Mesh Control from ShapeFX. Not only does it do what every good little black dress does it also throws in body control for the perfect fit! Click the pic to shape up with this sheath now. TALL SHEATH DRESS WITH POWER-MESH CONTROL at Shapefx.com. $69. Sizes 6 to 16. 28" long.